Is the Boxee Box the best means of getting Internet videos on to your TV? Lets find out. There was a lot of excitement surrounding the release of the Boxee Box last fall following a lengthy Alpha and Beta test of the software. While it was always possible for people to build their own Boxee solutions with the software, there was a definite need for a pre-built solution for those who aren't as technical, yet want the ability to connect directly to their televisions. Lets take a quick run down of the pros and cons of using this solution. People who want to play ever video format out there, really desire a QWERTY keyboard interface. The first thing you'll notice upon removing the device from its packaging is the odd shape that they opted to go with. While as an "art piece" it's attractive, as part of your home entertainment system it's a gigantic annoyance: You can't store the device in some entertainment systems, and if you want to stack it with other equipment it's going to have to be the one that sits on top. While not a deal breaker, if you're someone with a lot of equipment, it is definitely going to be a checkmark in the "cons" column. Following your first appraisal of the design, you'll notice you have an SD card reader on the side while the back has an Ethernet port, two USB ports, HDMI out, optical audio and audio left and right channel ports for stereo speaker setup. This does limit the television sets that you can attach the device to. While not a real deal breaker for most people who would be considering one of these devices, it is something to ponder for those looking for a streaming solution. I'm also not completely thrilled with the connections being angled like the box itself, but its necessitated by the design. As with most devices of this nature, the case seems to be a real fingerprint magnet. Luckily you don't have to touch the Boxee often unless you choose to swap out content sources for the SD reader or USB ports. Powering on and off can be controlled via the RF remote control. Speaking of the RF remote, this could be one of the biggest blessings of the device, although it also suffers from some drawbacks of design as well. While the QWERTY keyboard is a wonderful addition to any remote control, it's difficult to type on without hitting buttons like the menu and play button on the other side. There is also an issue of knowing which way is up by feel when you flip the control over to use the cursor, play and menu buttons. 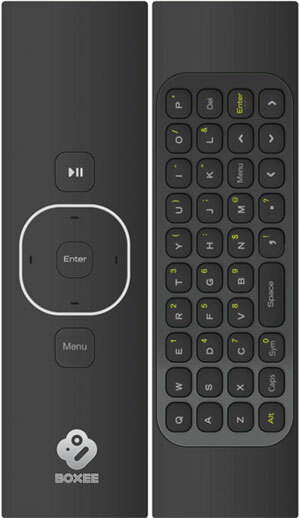 While most remotes have some form of difference in top to bottom so you can know without looking which way is up, I have found myself multiple times with the remote "upside down" in my hand, and I end up hitting the menu button instead of play/pause, or I move the cursor in the wrong direction because it's reversed. Moving on to the software, the Boxee software has its fans, and while I haven't used it anywhere other than on the actual Boxee Box, I can't say I am going to sign on as one of them. In its defense, I think it is an issue with controlling it via the remote more than the actual user interface, but it definitely has a "clunky" feel to it when you're trying to move around via the directional pad. When you go to a Web video, and you want to expand it to your television's full screen size, it can take you a bit to scroll down to the expansion button, and even when it becomes visible, moving the cursor over to it can take some practice and aim. While the Boxee Box offers you a lot of video choices, there is a definite issue of not knowing what is an app and what's going to take you out to a website. There is an apps page, but when you just go into the list of videos and movies, you never know where you're going to end up when you click on one of them. While getting the video should be the primary concern, the majority of Web videos out there were never meant to be blown up to the size of an HD television set, so you end up with video that was expanded way beyond the sizes it was ever meant to be played at. Not really a fault of the the Boxee Box, but it would be nice to have some sort of indication of where you're going before you click on it. Many fans of the Boxee Box continually point to the fact that it can handle a larger number of video formats and codecs than pretty much any other device out there, but your average user is not going to need anything more than AVI, MP4 and QuickTime. There are a slew of other devices out on the market now that can handle those files, stream the majority of the same content and sell for far less. In closing, everything I like about the Boxee Box, I can also find some definite downsides to. Such as I love the QWERTY keyboard, but yet I hate the shape of the remote. I find the actual box pleasing to the eye, but hate that I am so limited in the number of locations I can place it. I love the fact that it seems like Boxee can pull video content from just about anywhere, but yet they make it so hard to control and you never know where you're going. When you consider that television sets are coming with more ways to view Internet videos and your own content, and there are other streaming options out there such as the Roku that sell for $99, the drawbacks of the Boxee Box and its $229 suggested retail price just make it impossible to recommend it to any one other than the hardest core home video enthusiasts. The folks at D-Link sent me a Boxee Box to check out, as they did for our own Noah Kravitz, and now we have dueling reviews going on here at TechnoBuffalo. You can check out the first part of Noah's Boxee Box video review here on the site as part of his connected TV series.